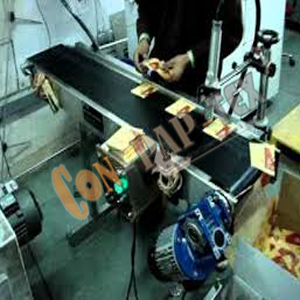 We are manufacturer, exporter and supplier of Conveyor for Batch Printing. We have designed and built to enabling Ink Jet Coding Machine on Conveyor for Pouches Batch Printing and many more. Ink Jet Batch Coding Printing with Auto feed conveyor. Also, it is applicable for industry to produces thousands of labels per day. Also, Batch Printing Machine with the help of the modern techniques and machinery such that it is suitable per production industry. It is design with features like, Automatic Feeding, Easy Controls, Accurate Registering, High Speed and many more. The manufacturing of our MS and SS conveyor is fully customized per your product requirements. It allows using materials like sealed good and bulk materials. MS Conveyor has designed with scraper chain, machine shell, sprocket, protection device, drive, tension device for your maximize production uptime and efficiency. Our MS and SS Conveyor are specially designed for heavy-duty, it is enabling high efficiency and conveying production lines running for longer duration. Our belt technology for SS Conveyors are built with complete steel belt system with custom designed to meet business requirements.